Is there any significance to it? Or is it just random? This may be a reference to an obscure "trend" from Scotland. "The Stonner", a 1,000-calorie, deep fried pork sausage kebab has been dubbed the most dangerous fast food in Britain. The connection is that Vision and Scarlet Witch are hiding in Edinburgh, Scotland and they got to make a reference to a local 10+ year old fast food trend. It just lets you know they are in Scotland. If they were in Paris they might sit in a café somewhere that had the Eiffel Tower in view. If they were in New York they might have yellow cabs going by or perhaps if they wanted to indicate that they were in New York prior to 2001 they'd be somewhere you could see the World Trade Centre. All of these things let the audience get a sense of where in the world characters are. While deep fried kebabs specifically are more of a Glasgow thing than an Edinburgh thing, Scots are well-known for their deep-frying of food that most people would not, so it serves as a signifier of the location just as a red double-decker bus would in London, and so on. The St Andrew's Cross flag on the poster also serves the same story-telling purpose. It's no different in this regard than Captain Rogers running laps past Sam Wilson at the Lincoln Memorial Reflecting Pool in The Winter Soldier telling us that the action is taking place in Washington DC, and so on, but people are making a bit more of a deal out of it because the Scottish fondness for deep-fried food, often already highly calorific and fatty even before it was fried, is something that amuses a lot of people already. Within about a minute of this scene, at 38:02 into the movie, the Vision is impaled through the chest by Corvus Glaive's spear. Like a kebab. The scene is filmed in Edinburgh (this particular shot appears to be looking up Cockburn (pronounced coh-burn) Street towards the Royal Mile, with other parts of the scene in the same area (including on the Royal Mile at the top of the street and Waverley Station at the bottom of it). As discussed in other answers, it appears to have been placed as a fun reference to Scottish food culture. See this list from The Telegraph, which includes such things as deep fried pizza on a list of 'Scottish Delicacies', as an example of the view of Scottish food. The takeaway shop unit was set up for the film and isn't genuine. If you are looking for the fast food shop that promises to "deep fry your kebab", you will be sadly disappointed. These signs were set up specifically for Avengers: Infinity War, and were promptly dismantled after filming wrapped up. “The Marvel films are well-known for their tongue-in-cheek humour and it’s great to see the filmmakers having fun and playing on Scotland’s real quirky culinary creation, the deep fried Mars Bar, which has enjoyed something of a cult following among visitors,” Film and Creative Industries manager Jenni Steele told us. It is an easter egg referencing the hidden scene at the end of the first Avengers movie. 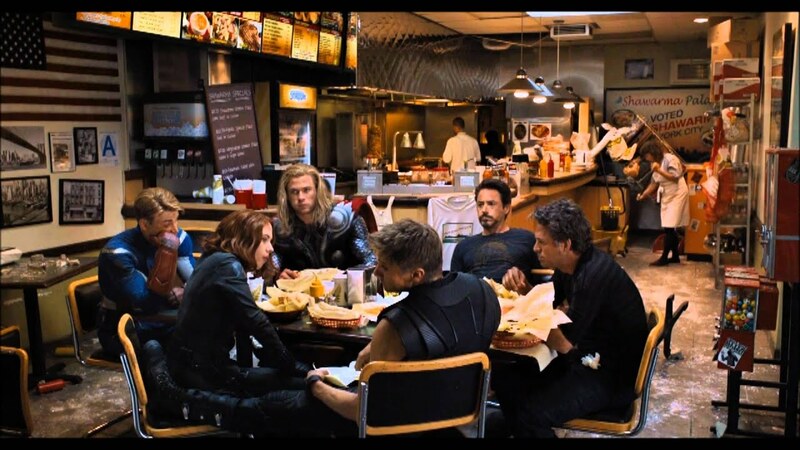 At the end credits of the first Avengers movie, there is a scene where the Avengers are eating into a Kebab shop, exhausted by the battle. This is even foreshadowed earlier by a line of Tony Stark saying "There is a shawarma joint about two blocks from here." You can see a frying kebab in the background. As for the scottish flag, I guess this is either a way to indicate the country they are in or, as in m1gp0z's answer, a reference to a local dish. Not the answer you're looking for? Browse other questions tagged analysis marvel-cinematic-universe avengers-infinity-war props . Who was the Arrested Development Character in Avengers: Infinity War? What video game was Groot playing?